To set up your PukkaTeam profile, go to the menu in the top right and click on 'Your Settings'. Now on the left of the page, you will see a sub-menu with Profile, Team's and Security, let's take a look at each of them. Here you can add your profile picture. Add your name, and change your email address if needed. If you use Skype for calling teammates, add your Skype name. Change your time zone, so teammates will be able to see your local time. 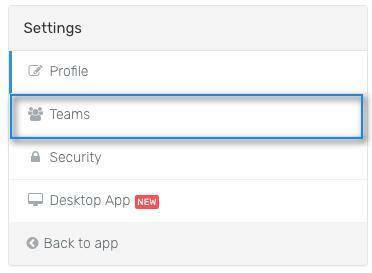 Here you can set up a new team and see the teams you're part of. Any team you are part of you have the ability to leave, any team you've set up, you have the ability to delete. Here you can change the password you use to login to PukkaTeam and enable Google two-factor authentication. This is where you can download the apps for Windows and Mac. Take you back to the app.